The Crosspulse Rhythm Duo offers captivating, seamless performances that both entertain and educate young audiences – exploring the rhythmic possibilities in the world around us. 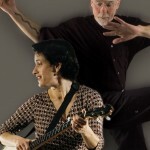 Often on tour internationally with performance projects, Keith Terry & Evie Ladin include educational services in their programming. Keith Terry is a percussionist/rhythm dancer whose work encompasses a number of allied performance disciplines — music, dance, theater, performance art — which he brings together to create an artistic vision that defies easy categorization. As a self-defined “Body Musician,” Keith uses the oldest musical instrument in the world — the human body (his own) — as the basis for exploring, blending and bending traditional and contemporary rhythmic, percussive and movement possibilities. 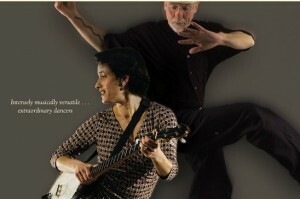 Evie Ladin is a banjo player, step-dancer, singer, songwriter and square-dance caller with a lifetime of experience in traditional American cultural arts. She grew up in a trad folk scene up and down the Eastern Seaboard of the US, travels the world, and calls the rich arts scene in Oakland, California home. She also tours with The Stairwell Sisters, an all-gal old-time teardown, and Keith Terry & Crosspulse, performing rhythm-based, multi-cultural music & dance works. She teaches banjo, harmony singing and dance and calls rowdy square dances in the San Francisco Bay Area when you can find her there.